I have been receiving a daily message from The Universe for nigh on a decade now and they are usually a little bright spark in the day, often more than that. Sometimes they are uplifting, amusing and just occasionally they are incredibly spooky, as if TUT had read your mind or, as one of my colleagues likes to say, as if he had CCTV trained on your house. I recently turned on a colleague to TUT’s daily messages and she wrote to say “Judith I’m still loving these TUTs, they are so often spot on and I get wind in my wings from the humour.” Yes, I know, me too. It’s the PS I love best and you always have to scroll down (below his marketing message) to get the PS, that’s where the humour often lurks. Mike Dooley is the man behind TUT and you can sign up to receive his daily Thoughts From The Universe at TUT.com. 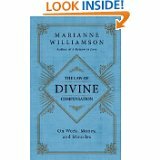 As luck would have it, in my Money-Making Magic Google Group we are reading a book together by Marianne Williamson called The Law of Divine Compensation, highly recommended by the way. This lovely little book has the feel of a prayer book in your hands and I find myself carrying it with me, for comfort, and often absent-mindedly stroking its cover during the day. The book is sub-titled, on the cover at least, On Work, Money And Miracles and I’d enjoy a miracle right now in one area of my life so I began my second read-through last night. You notice stuff on a second reading that passed you by on the first, or the thoughts and concepts embed more deeply. I noticed how much this book is about Love, about moving from a place of Fear to a place of Love. Miracles come from being Love, thinking Love, eating Love, dreaming Love, sleeping Love, praying Love, sending out Love, working from a place of Love – you get the gist. So last night on putting my head on the pillow I used my favourite I AMs that Wayne Dyer taught me and said a lot of ‘I AM Love’s and kept saying them overnight, waking and sleeping, each time I turned over and put my head on the cool pillow again and this morning on a little lie-in, I spent most of the time saying/thinking/breathing/being I AM Love. And then today’s TUT message arrived in my inbox and yes, he’s only had his CCTV cameras trained on me overnight. His PS today says “And where there is Judith, there will be love.” Yes, that’s 100% right. Where I am today, there will be Love.